GetResponse is an email marketing service for managing contacts and sending newsletters and campaigns. Learn how to use GetResponse forms on your WordPress site. In your WordPress admin, go to 'Formidable' → 'Add-Ons' and click the 'Install' button for the GetResponse WordPress plugin. Once the GetResponse WordPress plugin is installed, a new global settings tab and form action will be available. Your WordPress site needs to be linked to your GetResponse account. Go to GetResponse.com and log in. 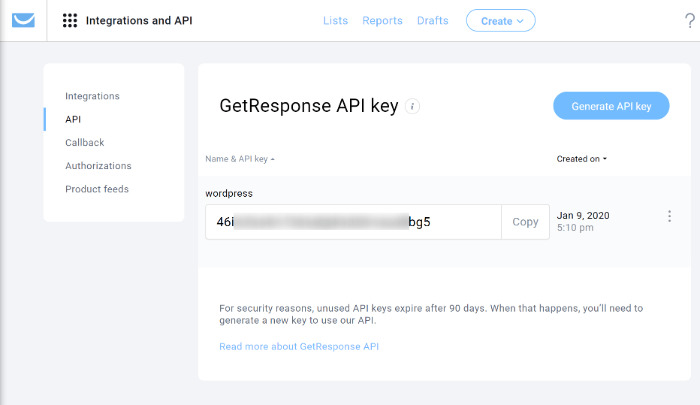 Go to Integrations & API → API to find your API key. If there is no API key listed, click the "Generate API key" button. In a new browser tab, go to Formidable → Global Settings → GetResponse. 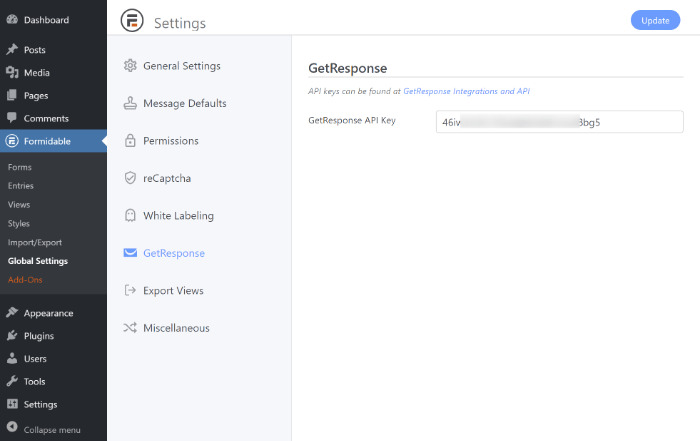 Copy and paste your GetResponse API key on the Formidable Global settings page. Now the form is ready to be mapped to GetResponse fields. Click on the Settings → Form Actions tab. Click the Add to GetResponse icon to add an GetResponse action to your form. Give your GetResponse action a Label for easy reference. This label will only be seen on the back-end. Select the GetResponse list and then connect fields from your form with the GetResponse fields. Be sure to map all required GetResponse fields. Submit the form and a new contact will be added in GetResponse after the double optin email is confirmed.